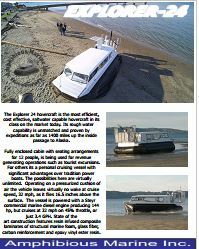 The Explorer 24 commercial hovercraft is the most efficient, cost effective, saltwater capable hovercraft on the market today. It has a fully enclosed cabin with seating arrangements for 12 people, and is being used for revenue generating operations such as tourist attractions. 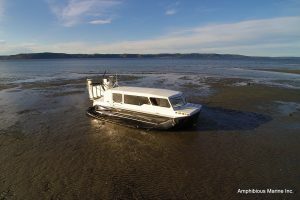 Other uses could include personal cruising vessel, remote cabin access and exploration, with significant advantages over tradition power boats. The possibilities here are virtually unlimited. Principle design concepts are mechanical simplicity, low noise, rough water capability, minimal maintenance and low operating cost. 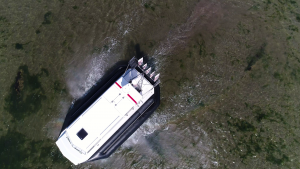 The first goal is largely achieved with a single marine diesel engine. 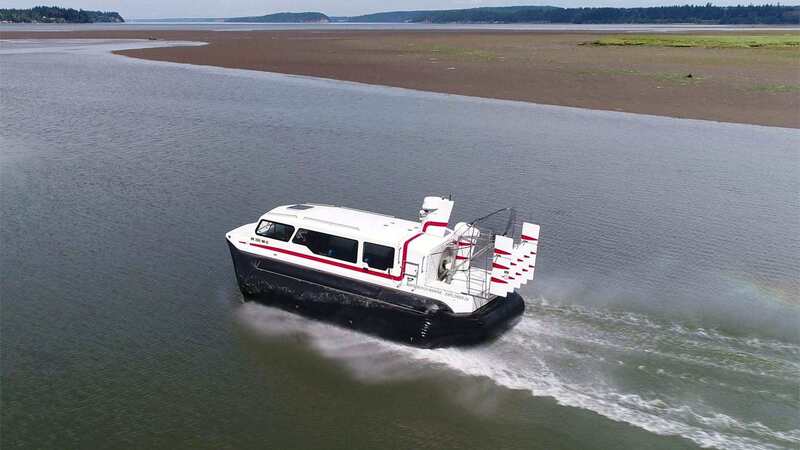 Many hovercraft have tried single engine designs, but few have mastered it with such success and simplicity as the Explorer 24. The powerful braking/pivoting feature that aides in both stopping and maneuvering, is another example of simplicity. It allows exceptional control of speed, turning radius and tight maneuvering without the need for reversing props, complex rudders and the like. 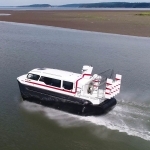 The craft operates on a pressurized cushion of air, therfore the vehicle leaves virtually no wake at cruise speed, 32 mph, as it flies 16.5 inches above the surface. This vessel is powered with a Steyr commercial marine diesel engine producing 144 hp, but cruises at 32 mph on 45% throttle, or just 3.4 GPH. State of the art construction features resin infused composite laminates of structural marine foam, glass fiber, carbon reinforcement and epoxy vinyl ester resin. The Explorer 24 video can be see here. Unlike older aluminum designs you might see, this craft is capable of more payload and speed for a given amount of horsepower. This means reduced fuel consumption, less noise, lower initial cost and reduced operating costs. In face some craft use two even three times as much horsepower while carrying less payload. Explorer 24 noise levels are similar to most inboard jet boats but lower than that of outboard jet motors. The 2200 pound payload is based on a deep water plane out with an 25% added margin for wind or other adverse conditions. For example, a maximum plane out test will show about 2750 pounds payload. Payload includes people, fuel and gear. Empty weight of the craft is approximately 2200 pounds and the standard trailer weighs about 800lbs. Operating range with the stock 38 gallon tank at 32 mph is approximately 325 miles while allowing for a reserve. 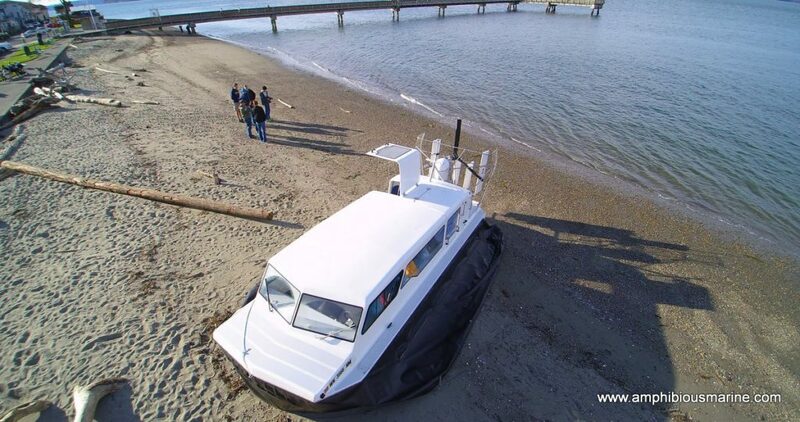 The Explorer 24 hovercraft is equipped standard with tinned marine grade wire, adhesive lined heat shrink connectors, waterproof electrical plugs, 304 or 316 stainless fasteners, stainless turbo exhaust piping, stainless shafting, six greaseable bearings, stainless steel guard and gelcoat finish. Saltwater option upgrades the propeller and lift fan frames to stainless tubing, the muffler to stainless, engine is painted, aluminum components are hard anodized or powder coated and certain drive components are made in stainless. 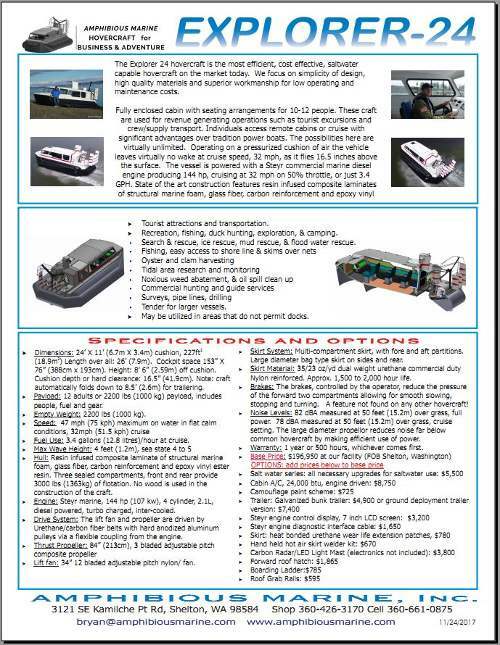 The unique Amphibious Marine skirt system uses a minimum amount of fabric while maximizing hover height and durability. Maintenance on the 36 ounce urethane coated fabric is commonly done on a seasonal basis, unlike some craft that require work after each run. Thin layers of urethane film or urethane coated fabric can be bonded to the six discrete wear areas on skirt, using a single part contact adhesive or hot air welder. Seasonal maintenance is completed in a matter of a few hours with very little material cost. When the engine is started the automatic clutch gives a smooth start for the fan and propeller immediately inflating the skirt to its full operating width. The lift system is fully operational at a very low throttle setting allowing for exceptional control without the need to operate the fan and propeller separately. The multi-compartment skirt system is unique in its capability to handle waves and wakes that would leave most craft with their nose in the water struggling to get moving again. Skirt width as measured at the ground contact point, 11 feet wide, and is 13.8 feet from outside to outside. When the engine is shut down the skirt system automatically folds down to 8 1/2 feet for trailering. This design has proven itself over the last 18 years, on trips as long as 1400 miles from Seattle to Juneau Alaska up the inside passage and an 1800 mile trip to the Arctic Ocean. Detailed specifications are available in the form of a downloadable PDF for your viewing or printing and there is a brochure as well. Please view the videos and photographs and feel free to e-mail or call with questions. Base price: Call for factory direct pricing. Ice rescue, fast, safe, & efficient rescue of people and animals. Flood water rescue. Hovercraft are immune to floating or submerged obstacles, debris, and swift currents. Fishing, fly fishing, ice fishing, and trolling. 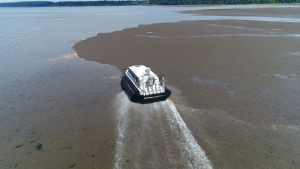 Tidal area research and monitoring. Dimensions Dimensions: 24’ X 11’ (6.7m X 3.4m) cushion, 227ft2 (18.9m2) Length over all: 26’ (7.9m). Cockpit space 153” X 76” (388cm x 193cm). Height: 8’ 6” (2.59m) off cushion. Cushion depth or hard clearance: 16.5” (41.9cm). 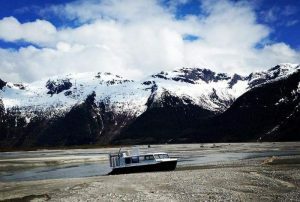 Note: craft automatically folds down to 8.5’ (2.6m) for trailering. Payload 10-12 adults or 2200 lbs (1000 kg) payload, includes people, fuel and gear. Empty weight 2200 lbs (953 kg). Fuel use 3.4 gallons (11.3 liters)/hour at cruise. Hull material Resin infused composite laminate of structural marine foam, glass fiber, carbon reinforcement and epoxy vinyl ester resin. Three sealed compartments, front and rear provide 3000 lbs (1363kg) of flotation. No wood is used in the construction of the craft. Engines Steyr marine, 144 hp (107 kw), 4 cylinder, 2.1L, diesel powered, turbo charged, inter-cooled. Drive system The lift fan and propeller are driven by Urethane/carbon fiber belts with hard anodized aluminum pulleys via a flexible coupling from the engine. Thrust propeller 84” (213cm), 3 bladed quick adjustable pitch composite propeller. Lift fan 34” 12 bladed adjustable pitch nylon fan. Skirt System Multi-compartment skirt, with fore and aft partitions. Large diameter bag type skirt on sides and rear. Skirt material 35/23 oz/yd Urethane approx. 1,500 to 2,000 hour life. A feature not found on any other hovercraft! Brakes The brakes, controlled by the operator, reduce the pressure of the forward compartment allowing for smooth slowing, stopping and turning. Noise Levels 82 dBA measured at 50 feet (15.2m) over grass, full power. 78 dBA measured at 50 feet (15.2m) over grass, cruise setting. The large diameter propeller reduces noise far below common hovercraft by making efficient use of power. None of the prices listed above include shipping and handling. We accept payments in the form of a money order or wire transfer, the preferred method. We will accept a personal check but we must give it 5 business days to clear the bank. We also accept payment through PayPal but a 3% charge of the total order will be added for processing. Our labor rates are $95 per hour.